Arnaud Lauret is the man you might know as API Handyman, the API believer we all love. In this interview, he reveals who he would like to be, what his homework dipsy doodles were, and what cardinal virtues every API should follow. 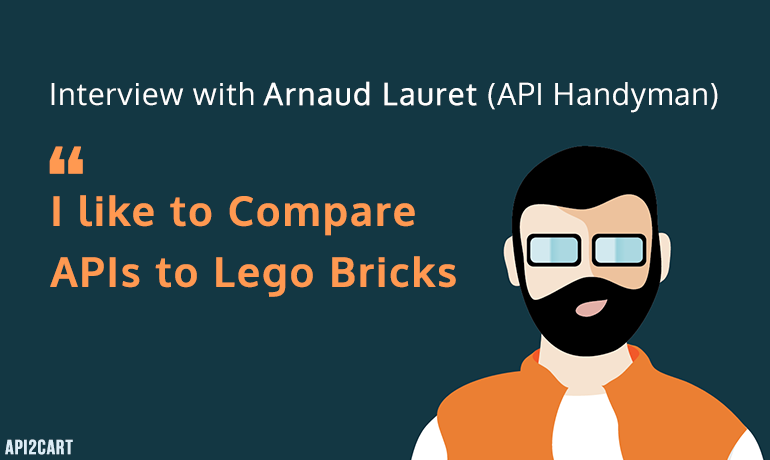 Many know you as API Handyman, which is both a mind-blowing name and a secret identity for Arnaud Lauret. Were there any other variants to go with the “API” part when the “Handyman” was about to become the matching piece? Yes, alternatives were Sorcerer, Padawan, Apprentice and even Barbarian and finally I came up with the “Handyman” idea that sounded perfect to me as I like to tinker at home and with computers. When did you discover your passion for APIs? Could you reveal some of your likes and/or hobbies other than APIs? I started to really work on APIs a little over a year ago (after years of SOA), but my API epiphany was at API Days Paris last December where I attended awesome talks and I found that my ideas concerning hypermedia and APIs were not so crazy. My other hobbies are retrogaming (I like to play old video games) and I also like to wander at car boot sales/garage sales/flea markets to find 80s toys, vintage cameras and old game consoles. In your bio, you mention that you would play with Lego and create cool things like a time machine. What event/ country/ era would you visit if you had one? Would you like to live a day as a historical figure? If yes, who would it be? You are currently working as an IT Architect in a leading insurance company. What was your dream job when you were a child? Could you describe your first coding experience? I had no particular dream job when I was a child, but I always inclined to do computer stuff. My first coding experience was using BASIC on an Apple IIe to solve simple mathematical equations for my homework when I was 12 years old. You have written a very interesting article for Nordic APIs. How would you answer the question, “should every company consider providing an API?” in a few sentences? Let’s make it short: Should every company consider providing an API? Yes! It’s the only possible answer because APIs brings simplicity and uniformity to an IS making it accessible to anybody and therefore offering business, and technical possibilities undreamed of. Every developer has their special understanding of what a perfect API is. What is yours? How would you explain the value of APIs to non-techie businessmen? Simplicity: Anybody should be able to understand what your API does and how to use it without being an expert or needing to dig for days in a complex documentation. Consistency: Always stick to design rules. Don’t surprise consumers with unexpected behaviours like deleting data with a GET or having the same data named differently in different contexts. Completeness: Always give all needed information when needed. Don’t let consumers in the dark (with an enigmatic 401 error without further details for example) and don’t force them to do things you should do for them (like calculating a loan rate based on provided data). Empathy: Since there is no such thing as perfection and that everything is relative, always consume your API and listen to people consuming your API. Therefore, you’ll see how to improve your API to tend to perfection. To explain the value of APIs to non-techie businessmen (and businesswomen! ), I’d like to compare APIs to Lego bricks. Anybody can understand how they work and how one can combine them even in unexpected way to create awesome products. And after that I used what we call in French the “sledgehammer argument”: I told them they can use APIs with Excel or Google spreadsheets. APIs have become an inseparable part of every possible business, including e-Commerce. How would you define the importance and implementation of them in this particular field? I’m not an e-commerce expert but as an end user I see the benefits of APIs in this field, it’s easy to add e-commerce functions to existing products (like buy from Amazon via Twitter) or combine multiple services in one (like Allo Resto or Grubhub) to offer great user experience. I’m looking forward to the “buy it” implementation on Pinterest. Without APIs, we couldn’t do such things, and this is only the beginning. What do you think the future holds for APIs? In the future, I see APIs everywhere and in everything. APIs will be mandatory for anything from small shops to government agencies, from power plugs in your house to cars. To build this future, we’ll have to work on standards/interoperability, discoverability and, most important, security.